Just the things that give a real sense of a working location, not just a model. I wish that I had half the level of your modelling sensitivity! I've always liked bubble cars (let's be honest, who doesn't?) and i recently stumbled across a cheap Lima class 121 so Brettell Road will get a class 122 to play with. Here it is ready for paint. The roof has had the grooves filled (not sure why lima did this when the retooled the 117 as the roof was the only bit of that model they got right ) with new vents from MJT. The cab domes are spares from the DC Kits 304 kit with my own etched fronts. The exhausts are spares from Dapol (with thanks to Geoff of Western Thunder for pointing out they were available as spares.) and the headcode boxes are microstrip. Buffers are from 51L and the bogies are Hornby class 110 as per most of my DMU's. Buffer steps are my own etch and the underframe had has some strategic holes drilled in it to open it up a bit. Very nice, Jim, but beware the colours that Lima used. The lining should be cream, as with the lettering and number, while the yellow panel should probably be deeper in hue. The other issue is that both lines changed level on the corner pillars, higher on the sides for the waist line, lower on the sides [slightly] for the cantrail line [which looks about right]. I trust we shall be seeing the eyebrows they always seemed to have after a while out of works? Plan to loose the yellow front altogether. I’ve a cunning plan to change the lining colour. The lining style seems to differ between class 121s and 122s. The lower stripe is kinda a halfway house between the 2. Edit, oh and the registration of the logo is miles off too! I was kind of hoping to avoid a repaint on the bubble car even thought the lining was closer to a class 121 than a 122, but when tried to remove the number and the roundels (which were off register) the underlying paint came with it so a repaint it was. I toyed with doing 55012 as it has a local significance. Being one of a few bubble cars that on the Stourbridge Town shuttle had a bit of a problem and ended up hanging over the road (see https://www.flickr.com/photos/69498057@N03/6353358089) but ironically I had already done it for New Street. I don't recall selecting it specially so 55018 it was instead. Just enjoying the photos again, a quick question about the last photo in the May 31st post. 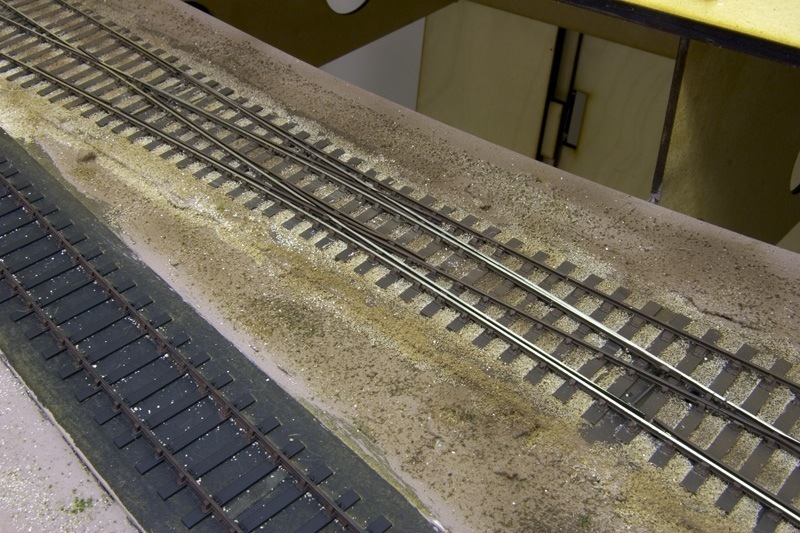 I really like the ballast into dirt and grass blend, what did you use for the dirt/ground and was it done at the same time as ballasting? I do the ground first using whatever I have to hand, scatter, pepper, powder paint, real dirt, chinchilla dust etc. So, I found a pretty cheap Bachmann 1f on Ebay and as usual, attracted to its somewhat out of proportion looks I snapped it up. First stage was to see just how easy the Brassmasters Easychas actually was. Ive used one of these before on my Kirtley but i didn't use it as intended so this time I decided to do things properly. For those that don't know the easychas is designed to fit around the RTR chassis and provide springing. Its designed to be used in 2 distinct ways. The super easy way that uses the original Bachmann coupling rods and brake rigging and the not quite as easy etched version. Naturally I went for the latter. If you decide to go for the former however you can get a sprung P4 (or EM) loco without even having to fire up the soldering iron! As it was the full monty approach only took an enjoyable afternoon to put together anyway. To coin an advertising slogan it does indeed do exactly what it says on the tin! Thanks Jim - you had already persuaded me that I need a Kirtley curved-frame 0-6-0 working an excursion over my 1920s S&D project - now I am going to have to 'borrow' Bath MR shed's 1F to deputise for a failed S&D Fox Walker banking engine, as far as Radstock at least...... rats! Moving on to the body of my 1F I removed the plumbing on the right side as my chosen prototype didn't have vacuum brakes. I also replaced the splashers with scale sized ones from Brassmasters. I decided that the lamp irons were a bit too chunky so replaced those too. The Brassmasters kit includes new coal rails. I thought the tool box on the the RTR model was too small so I used a spare left over from my Kirtley build. I also removed the cab doors which due to the Bachmann design was dead easy to do. The moulded rear window bars were very crude and hadn't been moulded properly anyway so those too were replaced. After these pictures were taken I replaced the buffers with Lanarkshire models examples. Below are a few images of the finished loco. The fireman (modelu) takes a breather! Although no one has said anything I've never been that happy with the back scenes on Brettell Road. Back scenes are a bit of a quandary as you dont want them to be naff but then you dont really want the viewers of a layout to notice them either. They kind of need to be there but not there at the same time. Initially I used a combination of brush painting and car aerosols to do them but with hindsight and a sprinkling of self reflection I probably didn't put in the time and effort I should have. Below is the first incarnation. Above is my revised version. I downloaded some textures from scalescenes and set to work on photoshop. I could have rendered my own textures but given what scalescenes charge it really not worth anyones time to do this in my opinion. Below are some more images before and after. Below are a few images of hw it all looks in the intended light. Very effective Jim and adds further depth. I would be inclined to reduce the light intensity of the windows of the furthest away painted buildings to conform with aerial perspective. Perhaps a more yellowish/grey? That would push the buildings back into the background where you want them. What struck me in the first pair, Jim, was the lack of the girder on the other side of the road bridge. The other thing I noticed, and in a way it follows on from Rob's comment, was the isolation of many of the backscene buildings, which was unusual in an industrial area; even if there were no industrial buildings behind the foreground ones, there were always terraced houses, pubs, shops, etc. for the workers, distant hills or something. I did note that there is now some vegetation in the background, but in some ways, for me, this just emphasised the apparent isolation of the industrial buildings on the backscene. Great to see the photos and read the suggestions for tweaks. I don't think it's just because it is an unusual depiction of the railway scene that this layout is so evocative. In the dark and in the rain - fairly normal working conditions! If you modelled inner London before the clean air act you wouldn't need scenic breaks - to be realistic you could have a layout that had a visible section of only a hundred yards or less! You can almost feel the rain dripping and breath-on-the-air in some of these photos on Brettel Road. Great work. The beauty of doing in this way is I can just print another building. I think I’ll add some internal clutter to the lit windows. The prints probably need a slight colour tweak to better match the modelled buildings (more orange). Brierley Hill still had a lot of farming and open cast mining (coal and clay) around at the time, especially in this area. Most of the housing was higher up in the actual town itself. Isolation is what I wanted because my research backs that up. Remember this is the edge of the town not the middle of a city (that’s the other layout! ). Last edited by jim s-w on Thu Feb 14, 2019 7:01 pm, edited 3 times in total. The beauty of doing in this way is I can just print another building. I think I’ll add some internal clutter to the lit windows. The prints problablt need a slight colour tweak to better match the modelled buildings (more orange). I also wonder if I might help the roofing glossy and only make the walls matt to keepe wet theme going a bit better? Brierley hill still had a lot of farming and open cast mining around at the time, especially in this area. Most of the housing was higher up in the actual town itself. Isolation is what I wanted because my research backs that up. Remeber this if the edge of the town not the middle of a city (that’s the other layout! ). Just a subtle impression of any clutter to the lit windows. I think the background buildings are about the right colour, if you make them more orange they will stand out more, cool colours recede, warm/hot colours advance. I'd also try to slightly blur the glazing bars and make them less 'black' for the far buildings. Not so sure about the tall building 10th image down, for me it does not quite work with the very light strip near the top. Methinks that the photo was taken way above the intended viewing height. Done a quick bit of fiddling about, again before and after. Your efforts do bring a great improvement, Jim. Not sure about the unlit windows though. A factory or whatever is likely to have large cavernous spaces, so all widows ought to be lit. Just an opinion, of course. Yeah, good thinking. Certainly the ground floors, either on or off really. I suppose a few more buildings should be dark as it’s kind of supposed to be the end of the day on an October evening so some places might have shut up shop for the day. 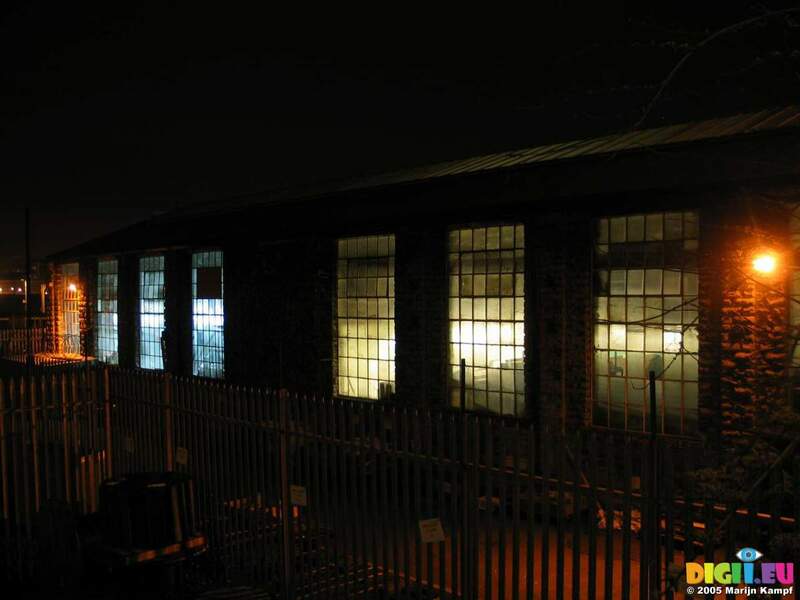 Photos of factories at night seem hard to come by. Even then, the film sensitivity etc. may lead to misapprehension. I'll admit I wasn't planning on the back scene post being a 2 parter but thanks to some helpful feedback I've had another look at what I did before. Changes are to add detail to the windows and make them more yellow/darker. Ive taken some magenta out of the prints and added some blur to various buildings to knock them back a little and give a better sense of depth. Ive also added a few extra details. Ive also left the roofs gloss while the rest of the prints are matt in an attempt to emphasise the wet effect I'm after. You can judge for yourselves the results below.